Posted on March 9, 2013	by cuong t.
In the last few years, given increasing gas prices and traffic, many Southern Californians have turned to Metrolink commuter trains as part of their daily commute. Whether you decide to drive, walk, take a bus, bicycle or get dropped off at a Metrolink station, once you arrive at your destination station, you’re reliant on some other form of transportation (such as walking, using a shuttle/ bus/ light rail/ subway or riding a bicycle) to reach your final destination. As many employers or destinations are located in areas far from transit stops or stations, bicycling to and from the train station has become an increasingly practical and healthy way to get where you need to be. With the debut of the Bicycle Car (with limited availability on select routes) transit users can bring their bicycle aboard the Metrolink train, secure it into a high-capacity bicycle rack and make their long distance bicycle-on-transit commutes work. For Metrolink commuter trains without these high-capacity bicycle cars, many areas near exit doors, aisles, stairwells, restrooms and other seats may be obstructed with bicycles, standing passengers as well as others with carts and luggage; all of which have potential of being safety hazards. For Metrolink commuter trains with the bicycle car, bicycles are safely secured out of the path of other Metrolink riders. Crowded train car designed to accommodate only three bicycles. One PVBC member contacted the Southern California Regional Rail Authority (doing business as Metrolink) via Twitter, Facebook, E-mail and U.S. postal mail requesting that a bicycle access plan be completed to address future ridership demands. Below is the letter sent to Metrolink’s CEO, Michael P. DePallo, on Friday, March 8, 2013. I am an Urban and Regional Planning graduate student at California State Polytechnic University, Pomona writing a thesis case study regarding bicycle integration on commuter rail. I am also a committee member of the Pomona Valley Bicycle Coalition, a regional chapter of the Los Angeles County Bicycle Coalition as well as an active volunteer and member of other bicycle coalitions across the Los Angeles metropolitan region and a Bicycle Ambassador in the San Francisco Bay area. I am among many who are staunch supporters and users of public transportation who view a service such as yours, as essential to help improve health and wellness through mitigating traffic growth, air pollution and most importantly, connecting people to their destinations. Metrolink has notably emerged as a very innovative regional force in providing safe and reliable public transportation. From pulling out the stops to debut peak-hour, directional express trains to constructing additional stations in previously underserved areas, Metrolink has pushed forward Positive Train Control as well as the development and acquisition of Guardian Fleet rolling stock, reinforcing its commitment to safety and ridership development. No longer relegated to operating during commute hours, Metrolink evening and weekend service has helped increase ridership to record levels, year after year. In addition, special trains serving Dodgers, Angels and Ducks games, NASCAR competitions, the Los Angeles County Fair and other community events have cemented Metrolink as a viable transit alternative outside of the work commute. Your commitment to service is what allows for dedicated and discretionary riders to make Metrolink their commute of choice. As a planner, I am sure that you are aware of a growing ridership segment that uses bicycles to connect Metrolink to their final destination. 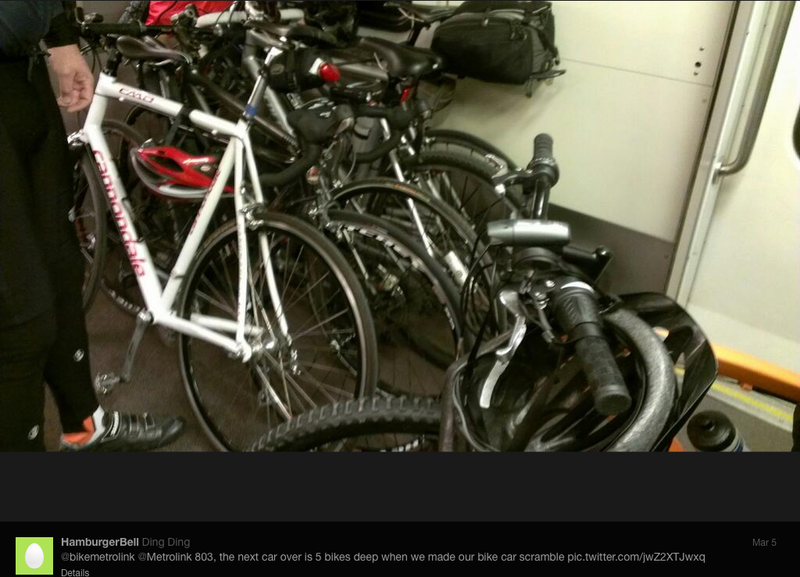 In recent months I have come across picture messages on Twitter posted by Metrolink riders (and retweeted @BikeMetrolink) regarding bicycle storage areas that are at or over capacity. I have also come across tweets praising Metrolink for innovative reuse of existing Bombardier rolling stock for bicycle carriage on a select number of trains. I am aware that in order for public transportation, such as Metrolink to remain viable at an operational level, growth needs to be encouraged through marketing efforts and services that benefit its diverse riders. As a commuter cyclist whenever possible, I use Metrolink to enhance my reach to a final destination. Cycling is very effective for short trips, whereas public transit works for moderate to long trips on well-served corridors. Combining cycling along with the capacity of Metrolink commuter rail service along already well-served transit corridors enable the ability to cover the first and last mile for those who cannot use transit or walk a reasonable distance to their final, suburban destination. What I request of the Southern California Regional Rail Authority is the creation of a comprehensive bicycle access plan to address your growing segment of transit ridership to ensure safety and quality for all. Such a plan may encompass bicycle carriage on transit as well as amenities on board trains and at stations for those who do not arrive by car. For example the plan can address bicycle car availability/ standardization across the entire fleet, identification markings and location of the bicycle car for each train set and wayfinding of where such cars will stop on station platforms. Proposals regarding bicycle rack use, destination tags, loading/ unloading procedures and availability of bicycle pumps and tools can be examined as well. A bicycle access plan will help Metrolink users and address future ridership growth, given the passage of California AB 32 and SB 375 as well as bicycle plans among your respective member cities and counties. As a rider and planner, I am committed to Metrolink’s innovation towards even greater success. What I envision is the creation of a partnership between SCRRA, metropolitan planning organizations, various cycling groups and bicycle coalitions in order to help strategize a bicycle access plan for your agency’s future growth. I have found substantial interest from riders as well as members of area bicycle coalitions in working together to enable and help market Metrolink as the commute of choice for more people across Southern California. Should you be interested in opening a dialogue to strategize future innovation, I invite you to reach out to the greater community, as your riders already tweet @BikeMetrolink. I am very committed to help Metrolink further succeed and I look forward to hearing from you and your organization. Thank you for your time and consideration on this matter. If you are interested in receiving updates, please e-mail bikemetrolink (at) gmail (dot) com with your name, name of the line that you use, station pairs and train numbers (if you are a regular commuter.) Also please follow @BikeMetrolink on Twitter, like Bike Metrolink on Facebook and add BoB Metrolink to your Google+ circles. If you are aboard a Metrolink train, please tweet any and all pictures of full or overflowing bicycle racks to @Metrolink and @BikeMetrolink along with the train number. An example of such formatting is shown below, tweeted by a daily commuter of the Inland Empire/ Orange County line. 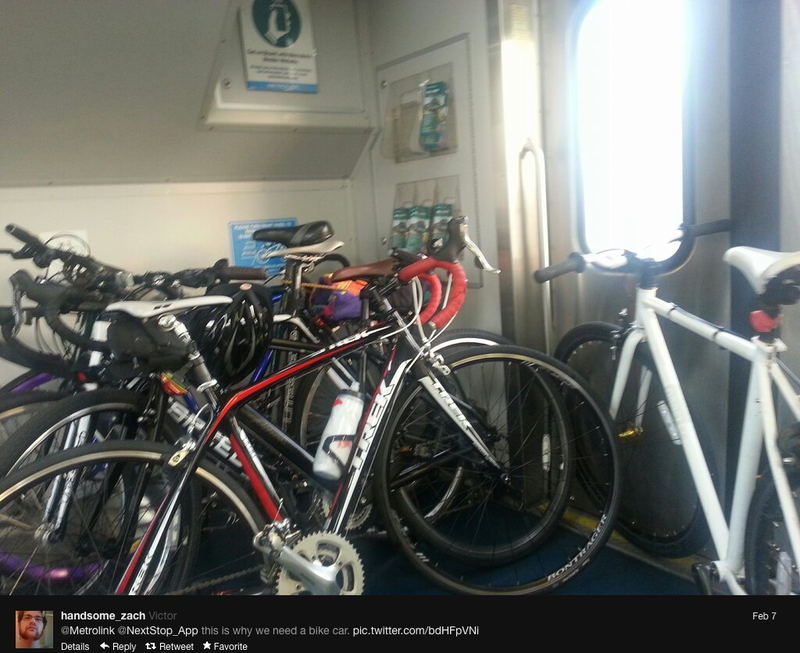 Example of a tweet to @BikeMetrolink and @Metrolink from a passenger on the IE/ OC line. This crowded train car was designed to accommodate only two bicycles. Should you have any questions or comments, feel free to contact Cuong via e-mail at bikemetrolink (at) gmail (dot) com, at a scheduled PVBC meeting or on Twitter @PedalingCuong or @BikeMetrolink. This entry was posted in Advocacy and tagged Metrolink bicycle car bike bikecar access plan. Bookmark the permalink.